Rising majestically in the center of Luang Prabang, the Phou Si mountain provides a magnificent view of the city below. Luang Prabang is a small quiet city in the Northern region of Laos. And as the ancient capital of the country, the city has many historical sites. However, Luang Prabang wasn’t declared a World Heritage Site by the UNESCO for its historical significance alone. 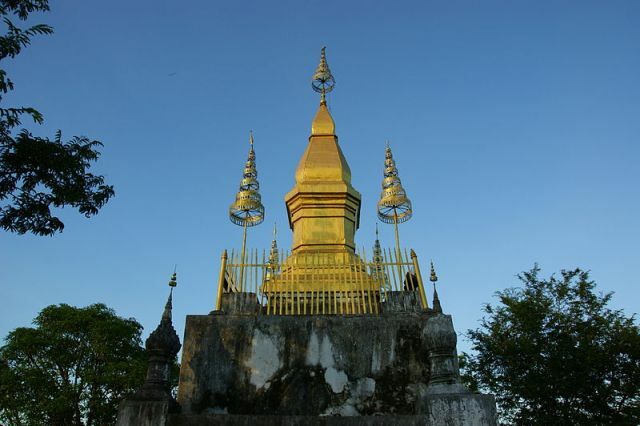 Luang Prabang is also rich in natural wonders and structures that are culturally important. One such tourist attraction is the Phou Si mountain. In fact, it is one of the most popular thousand-year-old landmarks in the city. At 325 feet high with several shrines and temples scattered throughout the sides, it depicts the country’s religious stance and faith. Around the mountain, there are also a number of routes that will take you up to the peak. And what makes this mountain popular with tourists of all ages are its paved and cemented steps (there are hundreds of them) that should have been the hilly ground. Using these, it is easy for anyone to reach the top and enjoy some of the finest views in Laos. Speaking by which, if you happen to be in Cebu, Philippines and you want to enjoy and marvel the beauty of city, visit Tops Cebu. The most popular steps leading to the top can be found near the Royal Palace Museum. This stairs take the form of a serpent as they lead to the temple of the Wat Pa Huak about halfway through the 328 steps. This temple is no longer being used although its Ordination Hall is still standing. And then there’s the Wat Tham Phou Si facing the Nam Khan River. At the top, a gold-plated temple stands atop a large rock looking magnificently grand. There is also a small sanctuary where believers can pray and meditate. This is also the best point for surveying the view below. Take pictures of the sights or just savor your triumph at conquering the hundreds of steps to get there. The view is said to be especially rewarding during sunrise or sunset when the glow of the sun in the horizon sets a romantic backdrop for the city below. Thus, it would be wise to plan your climb around sunrise or sunset. There are several stairs you can use to go down. There is another temple, the Wat Pra Buddabhat or the Temple of the Buddha Footprint from where you can start your descent. The Wat Pra Buddabhat is where you’ll find a replica of the Buddha’s footprint as well as other interesting religious structures. There is an ordination hall, a chapel and a statue of the goddess of water, Kuan Ou. In addition, a Buddha statue also guards the entrance to the temple. Another route down starts from the other side of the Kuan Ou image. You’ll see a stairway round the statue’s side that will lead you down to the Khan River. On the way down this stairs, you’ll see the Wat Wisunalat. You’ll also be able to see a shrine dedicated to kick-boxers and monks living quarters for another temple, the Wat Tham Phou Si. The Phou Si mountain will truly allow you to experience the rich culture, heritage and religious beliefs of the people of Luang Prabang, making it a must-visit in the city.